^ Stewart, George R. (1967) . 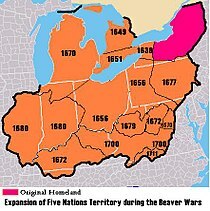 Names on the Land:A Historical Account of Place-Naming in the United States (Sentry edition (3rd) ed.). Houghton Mifflin. p. 191. ^ Foote, Shelby (1974). The Civil War;a Narrative, Red River to Appomattox. Random House. pp. 343-344. ^ Gray (1995), p. 202. ^ Gray (1995), p. 13. ^ Gray (1995), p. 350. ^ Haynes, Kingsley E. & Machunda, Zachary B (1987). Economic Geography. pp. 319-333. ^ a b c d “Indiana”. Funk & Wagnalls New World Encyclopedia. Funk & Wagnalls. ^ Logan, William N.; Edgar Roscoe Cumings, Clyde Arnett Malott, Stephen Sargent Visher, et. al. (1922). Handbook of Indiana Geology. Indiana Department of Concervation/. ^ Field & Stream. 76. CBS. (1971). p. 86. ^ Pulera, Dominic J. (2004). Sharing the Dream:White Males in a Multicultural America. New York: Continuum. p. 57. ISBN 0-8264-1643-8. http://books.google.co.uk/books?id=SVoAXh-dNuYC&pg=PA57&dq=Sharing+the+dream:+white+males+in+multicultural+America++english+ancestry&cd=1#v=onepage&q=&f=false. ^ Farley, Reynolds (1991). “The New Census Question about Ancestry:What Did It Tell Us?”. Demography 28 (3): 411–429. doi:10.2307/2061465. PMID 1936376. ^ Lieberson, Stanley; Santi, Lawrence (1985). “The Use of Nativity Data to Estimate Ethnic Characteristics and Patterns”. Social Science Research 14 (1): 31–56 [pp. 44–46]. doi:10.1016/0049-089X(85)90011-0. ^ Lieberson, Stanley; Waters, Mary C. (1986). “Ethnic Groups in Flux:The Changing Ethnic Responses of American Whites”. Annals of the American Academy of Political and Social Science 487 (79): 79–91 [pp. 82–86]. doi:10.1177/0002716286487001004. ^ Manufacturers in Indiana. Purdue University Center for Rural Development. (1998-07-19). Bodenhamer, David J.; Robert Graham Barrows & David Gordon Vanderstel (1994). The Encyclopedia of Indianapolis. Indiana University Press. ISBN 0-253-31222-1. Carmony, Donald F. (1998). 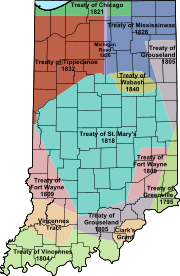 Indiana, 1816 to 1850:The Pioneer Era. Indianapolis: Indiana Historical Society. ISBN 0-87195-124-X. Gray, Ralph D (1977). Gentlemen from Indiana:National Party Candidates,1836–1940. Indiana Historical Bureau. ISBN 1-885323-29-8. Gray, Ralph D (1995). Indiana History:A Book of Readings. Indiana University Press. ISBN 0-253-32629-X. Indiana Writer's Project (1937, reprinted 1973). Indiana:A Guide To The Hoosier State. American Guide Series. Logan, William Newton; Edgar Roscoe Cumings, Clyde Arnett Malott, Stephen Sargent Visher, William Motier Tucker & John Robert Reeves (1922). Handbook of Indiana Geology. William B. Burford. Madison, James H. (1990). The Indiana Way:A State History. 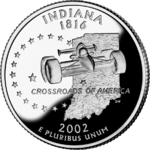 Bloomington and Indianapolis: Indiana University Press and Indiana Historical Society. ISBN 0-253-20609-X. Taylor, Robert M., ed. (1990). Indiana:A New Historical Guide. Indianapolis: Indiana Historical Society. ISBN 0-87195-048-0. Taylor, Robert M., ed. (2001). The State of Indiana History 2000:Papers Presented at the Indiana Historical Society's Grand Opening. Indianapolis: Indiana Historical Society.